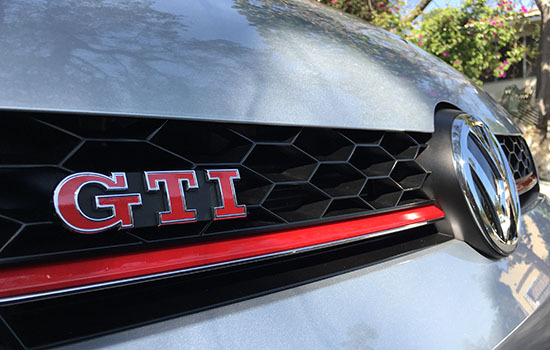 Burlappcar: VW GTI test drive coming up. Just got this car for a week. So I'll be...driving it! All the time. If you have any questions about it, go ahead. Like most VW engines, it sounds like a "quiet" diesel at idle. A big rush of power after 2500RPM. So I'd say a bit of lag. Feels solid as a small tank. The model I have is a loaded SE version. I drove one a couple of years ago and really liked it, so this should be a fun week. Only juveniles are interested in this car IMO. I'm curious to know Vince if you feel that the engine note within the cabin sounds "fake?" (I was a passenger in a manual-transmission 2016 GTI during a test drive and I felt that the artificially-augmented engine sound of slightly unsettling and felt out of sync with what I felt the motor was actually doing). I actually didn't know it was "augmented". It does have a booming sound to it. Most of the time, at low speed, it does sound a bit rough. But that's always been the case with the 2.0 Turbo from VW. Once cruising it is quiet. Like most engines. But it doesn't really feel out of sync with what its actually doing. But there is a lag. So that might be what you'd notice from a passenger seat? Vince- If you Google "Soundaktor" it'll be the first result and shows what it is. It is non-engine sound caused by a device that vibrates the windshield!